I know we don’t have to wait until the start of a new year to set new goals and change our mindset, but for me, it’s the perfect excuse to hit the refresh button. I’m a very seasonal person. I look at every season as a new opportunity for change, but sometimes it gets in my way because I wait too long to implement them. So what changes are coming? I’ll explain more below. When I first started blogging about 7 years ago, I used to share mainly fashion content because that was the most relevant topic in my life at the time. I was working for Nordstrom and all I did was eat, breathe and sleep fashion. At the start of my first blog, I was in a role as a Financial Analyst (WTF was I thinking). I was so eager to climb the corporate ladder that I took on a role that I wasn’t passionate about at all. Hence, my very first fashion blog was born. It was something to keep my creative juices flowing and show off all my purchases. When you work at Nordstrom (and get a discount), are in your 20’s, and don’t have much responsibility you tend to do this little thing called shop. That’s literally what my entire blog was centered around - shopping. But now, I hardly even get dressed up most days and shopping for myself has turned into buying things for Tayler and our new house. Okay, in all fairness, I still buy clothes for myself - but Mama knows how to find a deal (I literally just scored a $6 tee from Target the other day that I’ve already styled several different ways). 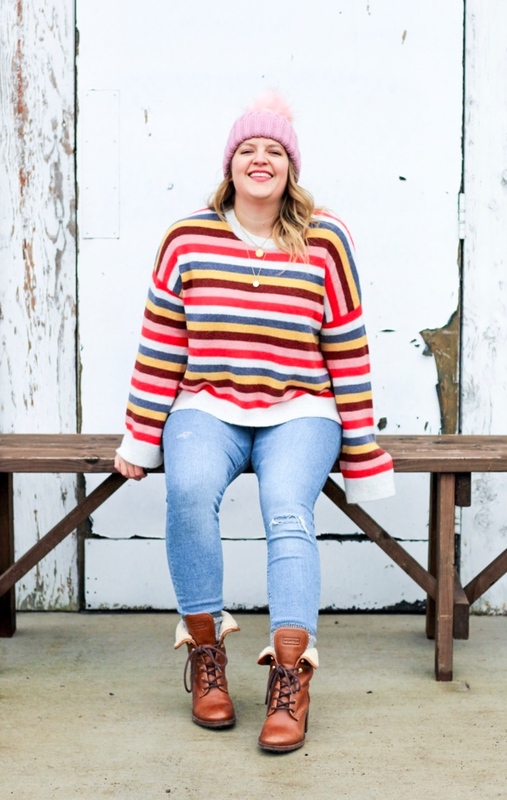 But every once in a while, I like to splurge on an item that brings me joy - like this rainbow colored sweater! It’s impossible to wear this and not smile! When I created Styled Out West, I was really excited to write about real life topics such as motherhood - how to be a mom and still do it all, navigating the pressures of going back to work or staying home - things like that. When I look back at my content over the last year and a half, I have barely written about any real-life topics I am passionate about. I also really love to write and a lot of the time I get wrapped up in only sharing posts that are product or shopping based in hopes to make some extra cha-ching. I still want to be able to share fashion related content with you, but I want to do less of just outfit sharing on the blog and more of it over on Instagram or the Liketoknow.it app. Style content on here will be more how-to based going forward. And if I’m being completely honest, those curated looks I produce (like the images here) are a lot of work. I have to purchase a new outfit, find someone to do a photoshoot (either pay a photorgraher or use a blogger friend), edit the photos and then hope that someone buys something so I can make some money from all my efforts (I do make a very small commission based off affiliate shopping links). While these are so much fun for me because I love to share my personality through fashion, it’s not all I’m about. So what can you expect on the blog this year? I want the blog to be more lifestyle oriented (travel, motherhood, healthy living) and home decor inspiration based, with a sprinkle of fashion. I am going to structure the posts a bit differently too and be more consistent with my posting habits. Here’s what you can expect going forward! Posting will be every Monday and Wednesday with a special Friday post either every other week or so. Monday will always be a lifestyle post - ex: how to be more organized, creating healthy lifestyle habits, the truth about being a working mom, etc. Wednesday’s will be style based - ex: how to create a capsule wardrobe, how to style your master bedroom, and a complete tour of our new home + everything I learned about a remodel, etc. Friday’s will be a bonus post of shopping content - ex: what items I’m loving that week and why (sizing info, etc), or big sales that I think you should know about. So there you have it! I hope you enjoy all the new content I have in store for you! And if you really want to keep up, make sure to join my mailing list so you never miss a thing. You can subscribe by entering your email in the in the box to the right hand side that says “join the gang”. You will get updates every time I post, as well as a weekly newsletter with exclusive content not seen on the blog! As always, thanks for following along! And to all the new members of the Styled Out West tribe…welcome to the club! I’m so happy to have you here! Looking back at 2018 and hello to the new year ahead!